The Lincoln Park real estate market is bounded by Diversey Parkway to the north, North Avenue to the south, Lake Michigan to the east, and the Kennedy Expressway to the west. Located just minutes from downtown Chicago, it is one of the city’s most sought after and charming neighborhoods. You will find cozy coffee houses beside four star restaurants, and stylish boutiques tucked amongst antique shops and bookstores. 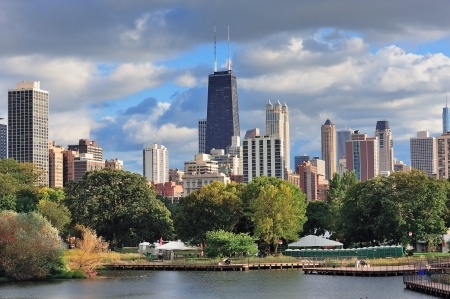 Of course, the prominent feature of this area is Lincoln Park itself, which offers 1,200 acres of playing fields, bike and jogging paths, picnic areas, a public golf course, and the renowned Lincoln Park Zoo. Bordering Lake Michigan, the park also offers lagoons, boat harbors and beaches. If you’ve got your heart set on purchasing a home in Lincoln Park, make sure you don't miss out. Register for email alerts when new Lakeshore properties become available. You'll also be able to save your favorite searches for later. In the meantime, see all Lincoln Park Chicago real estate below or learn more about this wonderful community. What About Lincoln Park Real Estate For Sale? Lincoln Park Chicago condos are located in one of Chicago’s oldest neighborhoods and are surrounded by some of the city's most fascinating and eye-atching architecture. Lincoln Park benefited from a series of urban renewal projects in the late 1950’s when many buildings dating from the Great Fire of 1871 were demolished, making way for newer residential construction. Home buyers then began to seek out existing Lincoln Park real estate and multi-unit properties as ideal rehab buys. Condos in Lincoln Park are spread throughout many individual neighborhoods, including the Old Town Triangle, which was designated a Chicago landmark district in 1977, and the charming area surrounding DePaul University, which has the ambiance of a small university town. 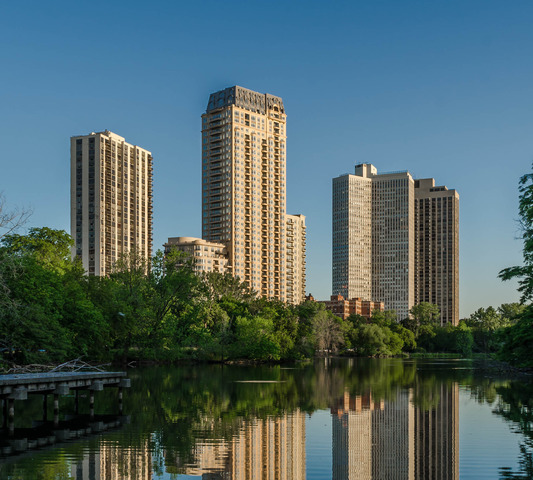 As a lakefront neighborhood in Chicago, Lincoln Park is of course home to a wide variety of high-rise condos that don't only offer sprawling outlooks of Lake Michigan, but also of the expansive 1,200 acre park space that's gives the neighborhood its namesake. Having Chicago's largest park as your own personal backyard is quite the amenity to have for Lincoln Park residents, and it's perfect for taking a walk, going for a jog, or to take the dog out to roam and stretch his legs. Some of Lincoln Park's most prominent high-rise sit right alongside the park, of which include the luxurious Lincoln Park 2550. Of course along with all the condos for sale in Lincoln Park, interested home buyers will also find an abundance of high-end single-family homes, townhomes, and even a nice selection of rowhomes around the DePaul area. Such luxury real estate usually comes with premium pricing however, but in most cases, is certainly worth every penny. Regardless of whether it's a condo or an upscale detached residence here in Lincoln Park, anyone considering this fabulous part of Chicago's north side should contact local real estate Helaine Cohen for more information, or to schedule a private showing for an available home or condominium! Isn’t it time you found your little piece of heaven in a Lincoln Park property? If you want to call this beautiful and coveted area your home, contact Helaine Cohen today!